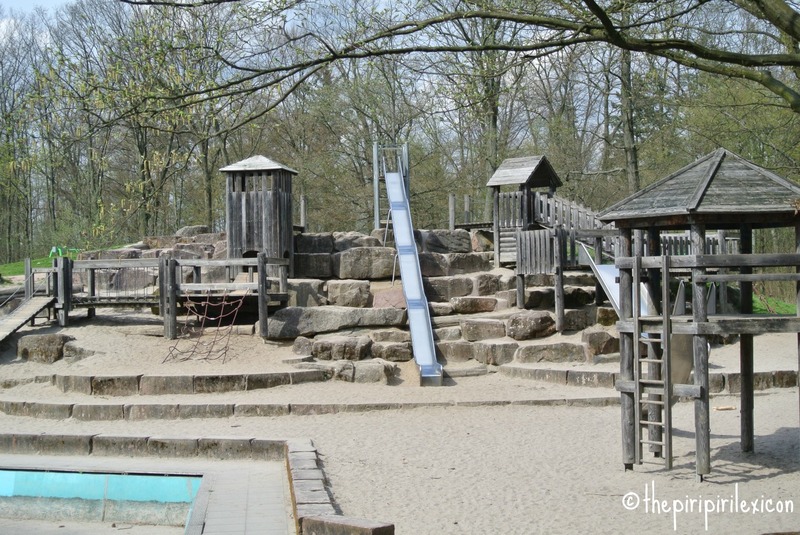 In a world of health and safety gone mad, minimising any risk for our children, providing a clean and safe environment, and not letting them touch anything, German playgrounds are a breath of fresh air. 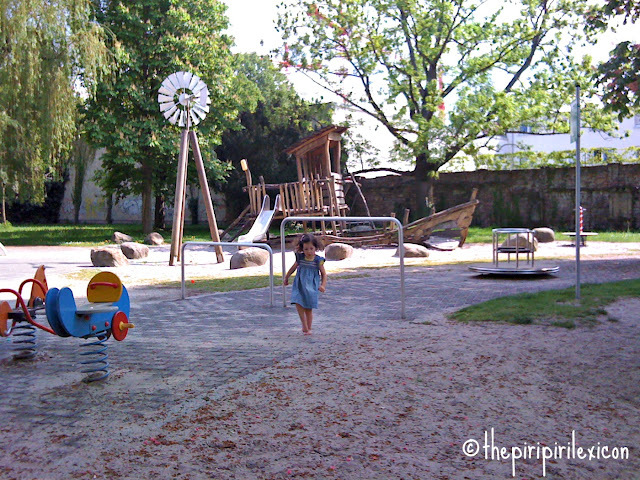 Coming from Britain (where health and safety is getting beyond ridiculous), we instantly loved the playgrounds here. 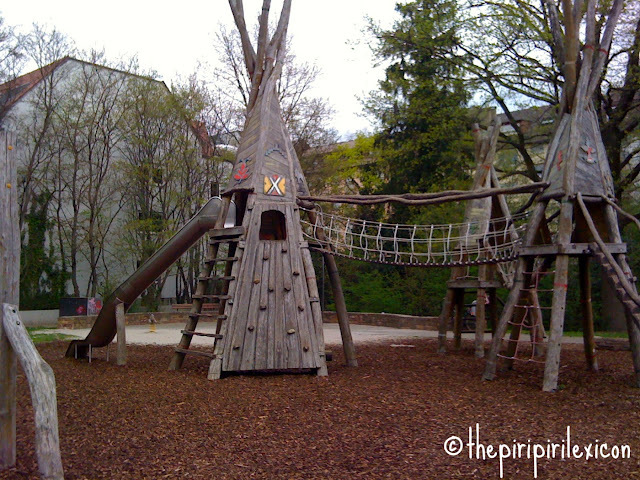 Of course, I hear you say, there are amazing playgrounds everywhere in the world. I am not talking about the ONE playground that is the only one around town (especially built or designed by an artist). I am talking about everyday playgrounds you can find at every street corner and where you take the kids on a daily/weekly basis. Karlsruhe seems to be particularly well equiped. The fact that Karlsruhe was UNICEF - Kinderstadt 2010 (Child-friendly city 2010) may have meant a significant amount of recent investment. Playgrounds are everywhere. When new flats are built, a small palyground is built in its courtyard (almost without fail). Whenever there is a small piece of greenery, there invariably is a small structure for kids. 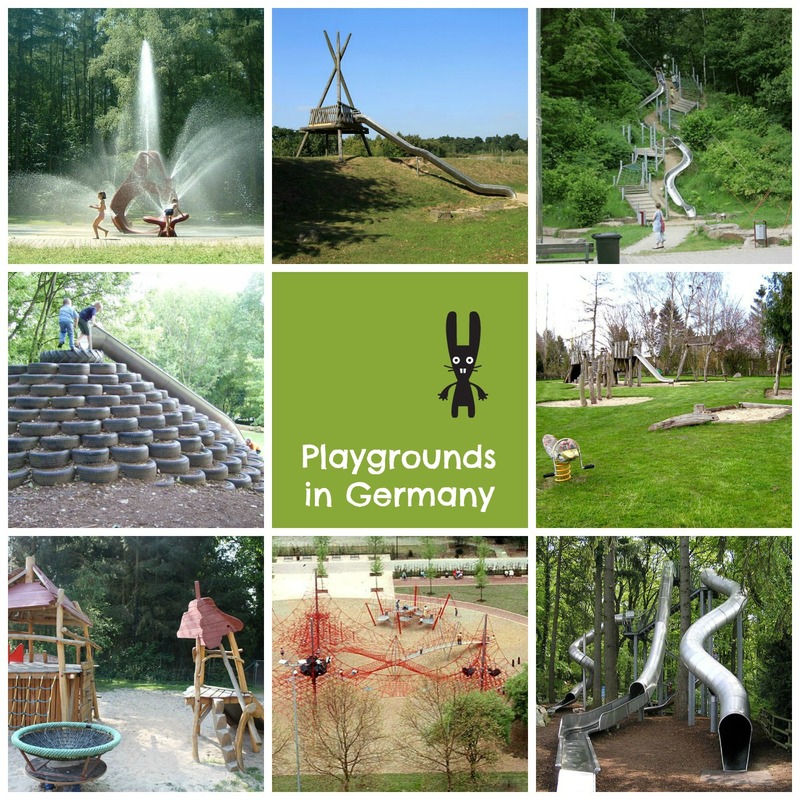 Some German friends who spent a few motnhs in the USA said they looked for playgrounds during their whole stay thinking "surely, this can't be it". It is not just the quantity though that is impressive. 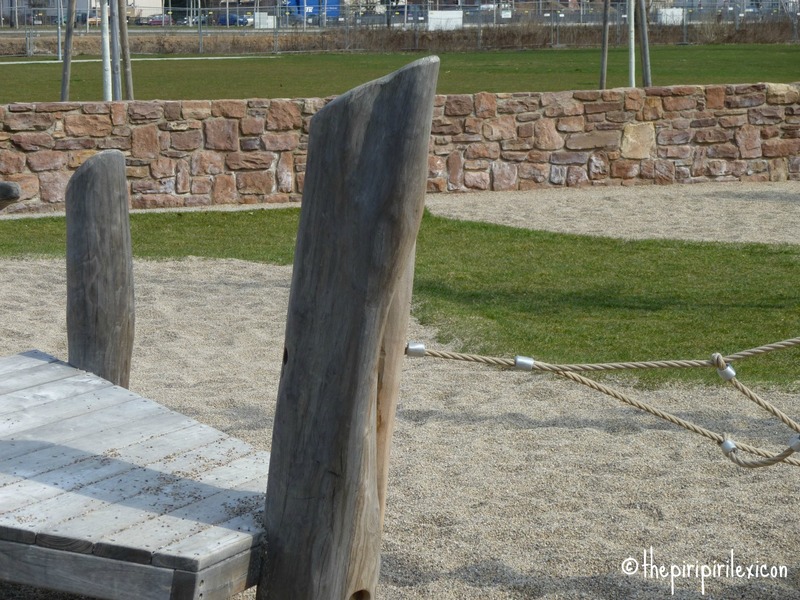 The quality of the playgrounds is great too. All are different. There are some plastic structures (the kind you find everywhere). But there are also others made out entirely of wood, plastic, or metal. The wood is not smoothed or sanded. A lot of the materials are left as raw as possible. The ground is sand, gravel, rocks, grass, or the traditional man-made soft tiles. Some playgrounds are aimed at young children and others for older kids. Water-based play is also omnipresent. The water is switched off in the winter. For the rest of the time, kids usually run around with wet feet (and more), digging tunnels, rivers and bucketing water all day long. Some structures are themed, others aren't. Parents also trust their children a lot more than in other places (from my experience). It is not unusual on a hot summer day to find kids down to their knickers (or even naked) playing in the water. I am not sure you would see that in a public palyground in Britain!! And they let their kids run around, falling, eating sand, throwng water, etc. I wanted to call this post 'Playgrounds in Germany' but then I reaslised that that would be lying a little as I don't have that much experience of palygrounds outside of Kalrsurhe and the surrounding areas where we live. 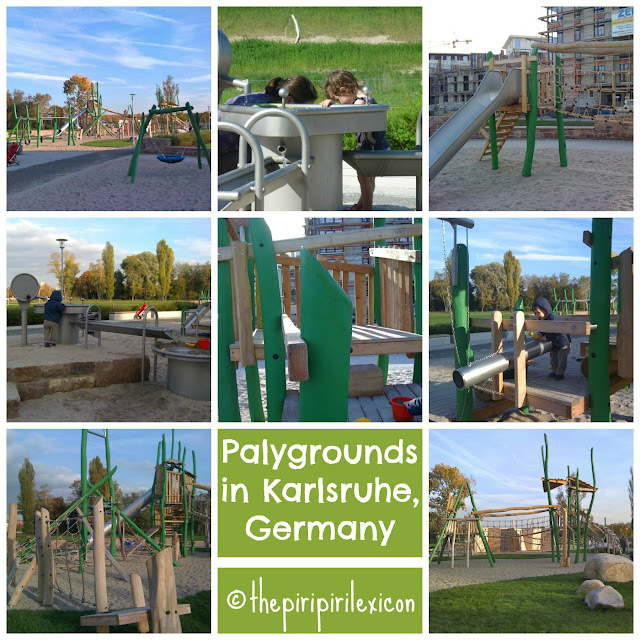 So, here we are: Playgrounds in Karlsruhe. From what I can see though, there are a lot of other amazing playgrounds around Germany. Hours of free and messy play still to come! You will when you have kids! Britain is ridiculous indeed on that front: swings removed, slides closed and the ones opened are not very exciting. Lucky you with all those fabulous playgrounds on your doorstep. I love this post! There are very few playgrounds in Malawi and we are about to move to Zambia which also has very few playgrounds but we've promised the kids we will build a jungle gym and I've been looking for inspiration. I love the photos you've posted and the fact that materials are left as raw as possible. Thank you for linking up to the Creative Kids Culture Blog Hop. I am glad I inspired you. 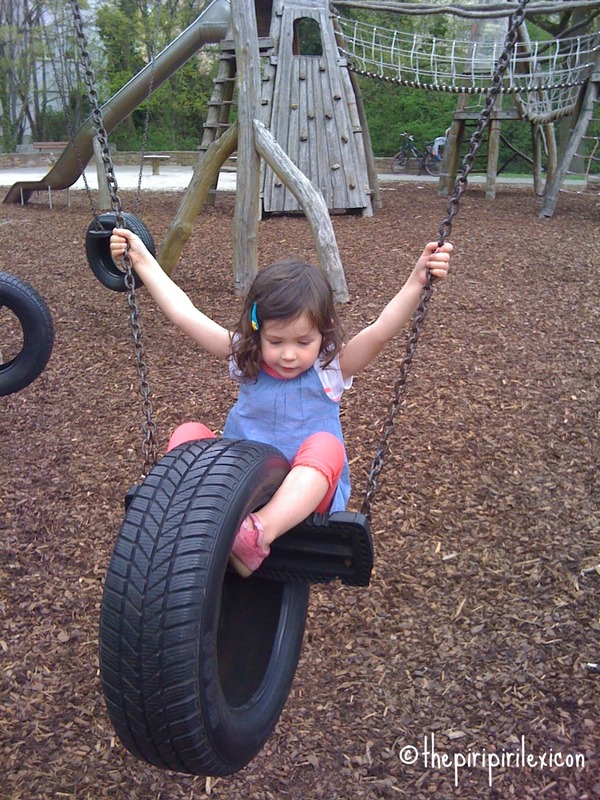 I love the pictures of all these playgrounds, especially the one that looks like a pyramid of tires? Thanks for linking up at the Creative Kids Culture Blog Hop #4! 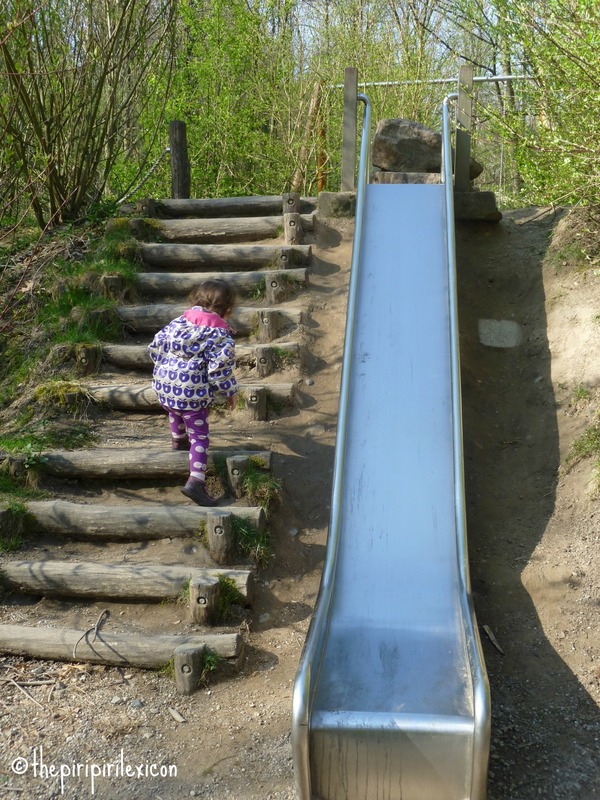 We are lucky in that the area we live in (Northern California) has many playgrounds, but none are as imaginative or as FUN as the ones you describe here! They are all the plastic, man-made structures. Fun, but I think there is something about having kids around natural materials. And definitely wouldn't see kids running around naked! Thanks for sharing at the Culture Kids Blog Hop! I featured you on this month's Creative Kids Culture Blog Hop - please come grab your "Featured" button! It is more of a suggestion than comment. It is always quite critical to maintain hygiene standards at any place that is being used by kids. Kids are more sensitive to germs and unhygienic condition may get expose them to serious diseases. Places like indoor play facilities, montessories, baby day care, etc. are always kept clean and tidy to minimize such chances. I disagree. We cannot kill all diseases and bacterias. Children develop their immune systems by being exposed to them. Plus Germany is quite clean (that is not just a myth).